At first glance it is easy to see Beuys’s suits as a nod to his impeccable style (I mean, who doesn’t love that ridiculous hat he always wore), but this work represents something much less vapid. 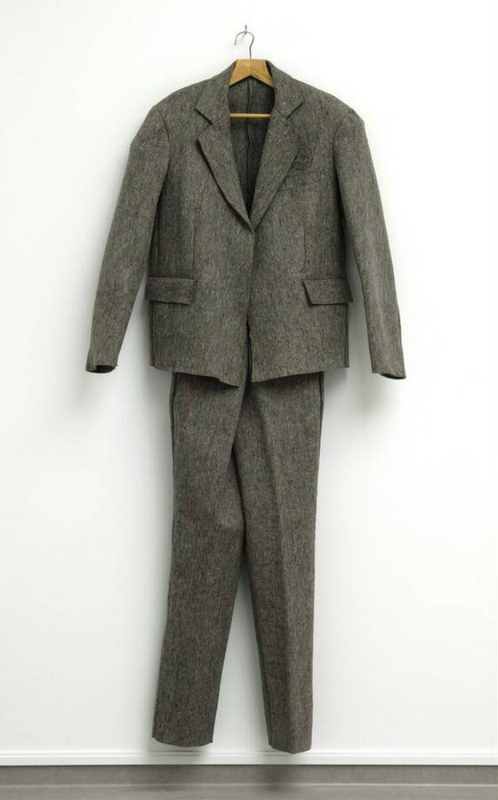 This is just one of one hundred identical felt suits Beuys created in 1970. These suits are based off of Beuys personal suit. That said, no one knows if the measurements are identical or how the suits were even made. It is likely the felt is made of hare or rabbit fur given his proclivity towards those critters. Beuys had a real thing for hares and was known to do freaky deaky things with them such as add their blood to his art or have a casual conversation with them for the sake of performance art. Beuys was also pretty vague about how he wanted this work exhibited. As Beuys once said, “I don’t give a damn. You can nail the suit to the wall. You can also hang it on a hanger, ad libitum! But you can also wear it or throw it into a chest.” Now that Beuys’s felt suits have been known to reach almost six figures at auction, I doubt anyone will be tossing these suits into a dusty chest. The decision to use felt for this series is the farthest thing from random. Beuys was completely obsessed with felt as he claims it was this material that saved his life. Beuys propagated an outlandish story that his plane was shot out of the sky during WWII and he was left for dead. That was until some Tartar tribesmen found him and quickly wrapped him in fat and felt, thus saving his life. To this day no one knows for certain if this really happened (in fact Beuys himself claims he was unconscious and out of it during the time of his rescue), but it is the closest thing we have to understanding Beuys’s obsession with the material. Felt to him represented warmth and was a life-giving material. While felt may elicit a warm fuzzy feeling in the artist himself, these suits are a conservator’s worst nightmare. Multiple museums have been faced with the harsh reality that their felt suits have been either damaged or completely destroyed by moths! Both the Tate and Neue Galerie have been victims to these little bastards, leaving their suits in decrepit states. An important thing to realize about Beuys is that he honestly believed human beings are inherently creative and that everyone can be an artist. That is why he produced work such as this suit: it is an everyday object, yet he is claiming it is art. He is trying to breakdown the separation between the banality of life and the fine arts in order to show people that everybody is an artist. Look how easy it is, Beuys just made a bunch of suits and now they are art! Well that's all fine and dandy, but I am pretty sure if I were to make a bunch of clothes and push them as art no one in their right mind would consider dropping the big Benjamins on me. I do appreciate the sentiment though Beuys, it feels good to know someone believes in me.